March 5, 2018, 3:11 p.m.
By Shan Wang @shansquared March 5, 2018, 3:11 p.m. The Denver Post? GREEN. The fake news site the Denver Guardian? RED. A site that’s not putting out deliberately fake news, but is overwhelmingly influenced in its coverage by a funder that it’s not eager to disclose? Maybe a YELLOW. That’s the proposed ratings system underlying NewsGuard, an initiative launched by Steven Brill (The American Lawyer, Court TV) and L. Gordon Crovitz (Wall Street Journal, Denverite), that intends to hire people with journalism backgrounds to assign more than 7,500 news sources one of three ratings — green, yellow, or red — and provide a 200- to 300-word write-up on each source’s funding, its coverage, its potential special interests, and how it fits in with the rest of the news ecosystem. (You can read a few sample write-ups, which NewsGuard is calling “nutrition labels,” on its site here.) 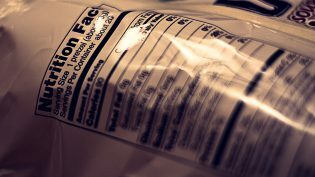 Not all of the sites in a given color category are equal, the founders acknowledge (“some are much more fair and accurate in their reporting than others”), but they hope the nutrition labels will clarify the reasoning for each rating, and dive into additional nuances such as the differences between opinion and news sections. Brill and Crovitz are looking to hire dozens of people with journalism backgrounds for the venture, which is based in New York and Chicago, and they intend to license NewsGuard’s encyclopedia of news sources to social media platforms and search engines. (Platforms licensing the database can, for instance, choose to surface only the nutrition labels or only the green-yellow-red designations for users, or choose to only make visible nutrition labels but use ratings as a ranking signal.) Another potential revenue stream could come from licensing the database NewsGuard builds up to advertisers who want to be spared any embarrassment that comes from advertising on deliberately fake sites, by offering them whitelists of safer — say, not red-rated — news sites. Two NewsGuard “analysts” research each news source and then settle on a rating (or not, if they feel they don’t have enough information to be confident in a rating). If the raters disagree, NewsGuard’s executive editor Jim Warren, managing editor Eric Effron, and its editor-in-chief will weigh in, and NewsGuard will make available all the backgrounds and conflicts and thought processes of every person involved in the decision process (it’s looking to add a second layer of fact-checkers who will fact-check the nutrition labels analysts have written. The NewsGuard site lists criteria that feed into each rating, such as points for whether a news site participates in the Trust Project, or whether a site appears to be trying to obscure its funders or its ideological bent. NewsGuard will publish corrections and comments, and welcomes suggestions to rate any sites it’s missed, Brill and Crovitz said. I asked what ratings some of the news sites that have sample nutrition labels posted (WhatisFracking.com, RT.com) are getting; Brill and Crovitz told me they are hesitant to explain ratings before these sites have gone through the formalized ratings process. But based on reading their ratings criteria and its nutrition label, a site like WhatisFracking.com, funded by the American Petroleum Institute, would likely end up a YELLOW. “We’re making the kinds of judgments that we think will be noncontroversial, but still are the kind of judgments that platforms, rightly, don’t want to be making themselves. They don’t want to put their finger on the scale at all,” Crovitz said. “A use case is…maybe that teenager who’s trying to figure out where a source of news comes from. If your crazy uncle sends you a news story that looks kind of crazy, it’d be useful for you to know whether that actually comes from a fake news site.” As NewsGuard builds up its database of ratings and nutrition labels, it wants to offer a browser plug-in version of its ratings and nutrition labels for free for educational purposes, such as to media literacy groups. Part of its efforts also include making available a 27-7 “SWAT team” that responds to breaking news and news items that are suddenly trending — their way of addressing the recent swell of criticisms that platforms and their algorithms seem to be unable to detect what individuals can easily spot. I told Brill and Crovitz that I personally didn’t feel confident about a normal news consumer’s willingness to read and accept all these ratings and nutrition labels presented in this way. 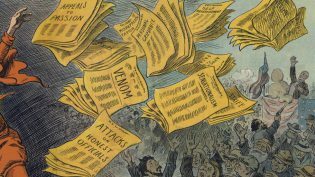 But platforms like Facebook have rolled out some product tests that suggest their thinking aligns with what Brill and Crovitz want to do with NewsGuard, such as adding a “more context” button on a news article shared to the News Feed that pulls from sources like the publisher’s Wikipedia page. 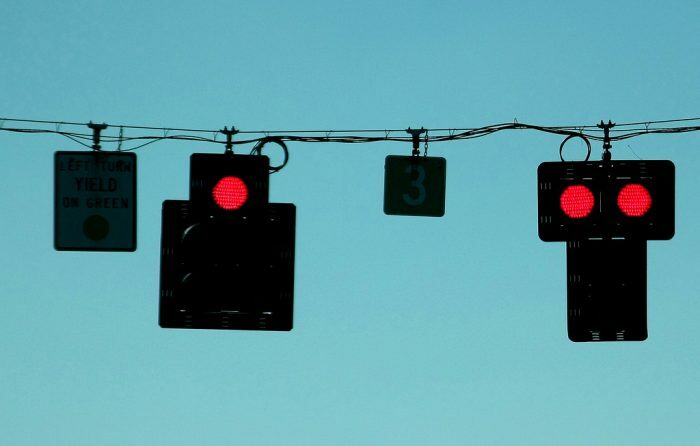 Photo of traffic lights, by Dave’s Domain. Used under a Creative Commons license. POSTED March 5, 2018, 3:11 p.m.
Wang, Shan. "This new initiative deploys humans to review, research, and rate U.S. news sites." Nieman Journalism Lab. Nieman Foundation for Journalism at Harvard, 5 Mar. 2018. Web. 19 Apr. 2019. Wang, Shan. "This new initiative deploys humans to review, research, and rate U.S. news sites." Nieman Journalism Lab. Last modified March 5, 2018. Accessed April 19, 2019. https://www.niemanlab.org/2018/03/this-new-initiative-deploys-humans-to-review-research-and-rate-u-s-news-sites/.